Lee.org » Blog Archive » BaconFest! Cupcakes with bacon icing – yes, cupcakes with bacon! Bacon wrapped jalapeño poppers – Powie! Zowie! 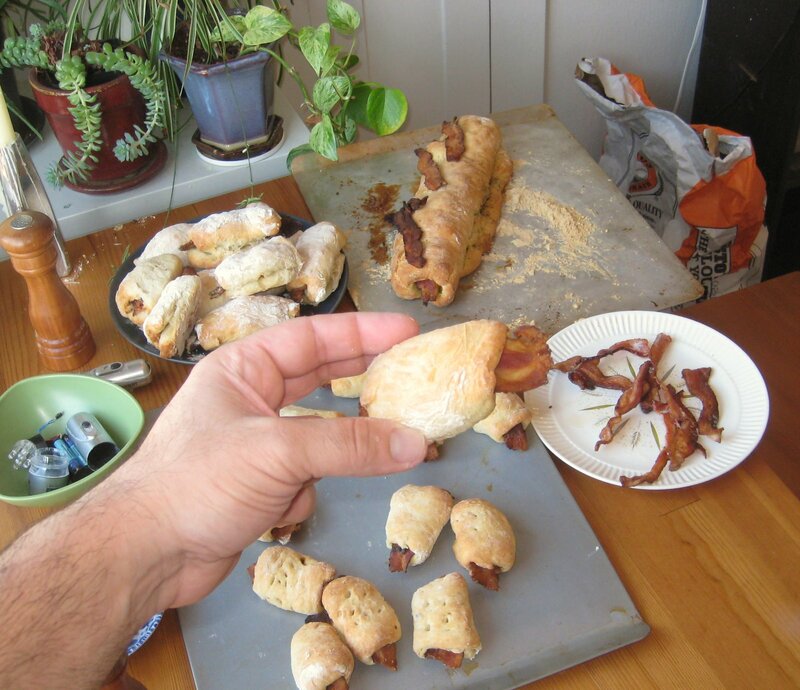 Mini bacon bread buns – one of my contributions! There were more bacon based finger foods that I consumed that added to the joy of the evening but, alas I forget what they were! Phoey! It was startling how within 15 minutes of arrival there was this bacon fueled frenzy of eating and “om om nom nom om!” and heated conversation with eye-rolling-back goodness. It’s weird that it’s hard to put my finger exactly on why it was so good. It was little like being drunk. It was… dare I say, the magic of bacon! CTP had left a pile of awesome bacon themed buttons. CTP is awesome.